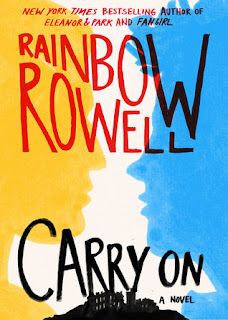 Simon Snow made his first appearance in Rainbow Rowell's Fangirl as the subject of Cath's fan fiction. Very reminiscent of Harry Potter and the Hogwarts magical universe, this book tells Snow's story as the chosen one destined to defeat the evil Humdrum. Unfortunately Snow is not a very good chosen one. His spells don't work right, he often doesn't know what to do, and he's more focused on his nemesis Baz than the actual Humdrum. He should be having a great final year at his wizard school--Watford School of Magics--but instead he's having problems with his perfect girlfriend, feeling distant from his father-figure school head, and he can't stop thinking about Baz. Carry On has plenty of magic and monsters and supernatural things, but at it's heart it's a love story between two very unlikely people. Anyone who ever read Harry Potter fanfic (particularly the Harry/Draco plots) will love this book. Carry On was the name of Cath's story in Fangirl, but this book is not written by her (or by the author of the Simon Snow series in that world). This is Rowell's story inspired by her own work. It's not necessary to have read Fangirl to appreciate Carry On. The story itself is entertaining, especially to fantasy fans, but as usual it's Rowell's characters who make us come back for more. Simon is the main character, but Baz is the most complex and interesting and proof that everyone is not always show they seem to be.